The project was developed to alleviate traffic congestion on the main thoroughfares; thereby, improving air quality. This is accomplished by providing transportation information to the commuter so that they can make informed decisions. 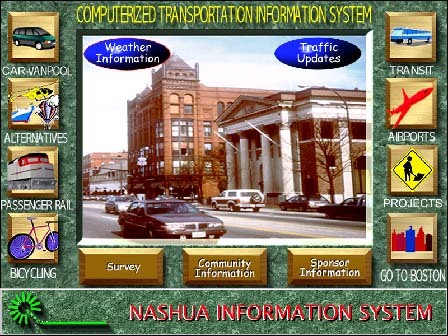 FutureTouch is responsible for developing a network of 6 traveler information kiosks located in public places and large employers in the Nashua, New Hampshire area. The system merges GIS technology, user-friendly graphical software, and unique Internet access functionality to deliver a broad range of information. This multimodal project includes public and private transportation, air, rail, and bike information.